Page 4 | March 21 2014 | Seminole Voice THIS WEEK do recently struggled with paying off impact fees to the city for its plaza location along Alafaya Trail. The diner failed to pay impact fees of $1,089.72 per month for Septem ber, October and November of last December. They recently fell behind in pay ments once again, owing a portion of their February fee and their fee for March. The city voted at their March 3 meeting to allow City Manager Bry if they continued missing payments. Dua received a notice of the city councils actions shortly after and immediately paid off the existing impact fee bills. Continued late payments will force the Breakfast Club of Oviedo to face the code enforcement mag istrate, who has the ability to shut down the restaurant, Cobb said. It allows the city to take code enforcement action, he said. Our hope is that theyll pay and get themselves on track. Resident Jane Masters said Oviedos shortage of classic diners would be cut even shorter with the loss of the Breakfast Club of Oviedo. We had nothing in this area, we had to drive to Longwood and Cas selberry, said Masters, who eats at the Breakfast Club of Oviedo every Monday. Id be lost without it and its only been open a few months. The Oviedo Diner along Geneva ed inside the building overnight. Owners Tony and Patty Nikollaj hinted on the diners Facebook page that they would eventually return, but no details have surfaced since. Oviedos 51-year-old Town House Restaurant will be forced to relocate to make way for the road widening of Broadway Street. Those plans are already in the works, with the restaurant slated to start con struction on a new nearby location in April or May. Its set to open once the old location is torn down in De cember. Oviedos impact fees are among most $30,000, he said. The Breakfast Club of Casselberry cost the Dua family only $7,000 in impact fees, though the building once housed a bakery that had al ready paid a portion of the fees. I didnt have any money to open this place up my father and my uncle helped Dua said. I have to pay them back on a monthly basis, so ev ery penny to me mat ters right now. But Oviedo Mayor Dominic Persampiere noted that, unlike oth er cities in the county, Oviedo allows businesses to pay off the impact fees over a span of 12 months, lightening them to grow. We put in place policies that are out of the norm for most munici palities in order to help the small business owner start their new ven tures, Persampiere said. However, the only thing we ask in return is for that business owner to abide by the payment schedule that theyve agreed to. Its not fair to all of those who have followed the agreements if we dont enforce the rules fairly for ev erybody. restaurant will be able to survive and pay off the necessary upcoming impact fee payments. The chain plans to open another diner in Altamonte Springs this month. DINER | Caught up on payments, but city threat still looms C ONTINUED FROM FRONT PAGE expired the last time in 2011. All of the sudden my rent was lower and then it hit me Oh, thats right. The sales tax went from 7 percent to 6 percent. I can give that guy a raise now. Seminole County Financial Administrator Cecilia Monti con ply to commercial property rent depending on how the lease is written. The lack of awareness about the penny sales tax or the election coming in May shocked Leavitt even further when he approached residents at the Taste of Oviedo event. Probably one or two out of 100 knew we were even going to have the election, Leavitt said. Im talking about people who are registered to vote. The countys decision to a hold a special election over the sales tax instead of waiting for the gen eral election could contribute even further to a lack of voter turnout, Leavitt said. Roughly 20 percent of Semi nole County voters cast a ballot in the 1991 special election when the according to Seminole County Su pervisor of Elections Michael Ertel. The turnout in 2001 for a special election renewing the tax brought just below 21 percent of the voters. More than double the amount of voters came out to the general election in 2010, when 50 percent of residents with voter registration made their voices heard. If I have a special election, youre eliminating the possibility of a huge percentage of the popu lation just not voting, Leavitt said. Geneva resident Richard Creedon said the county should take a straightforward approach with taxing residents, raising the millage rate if they want additional revenue for road projects. Leaving it up to residents on whether the tax is needed seems like a sneaky, hands-off method, he said. This way if people think it was the right thing to do, theyll give you a pat on the back, Creedon said. If not, maybe theyll un-elect you next time. Thats what youre supposed to do in a representative government. Youre not supposed to give it to the people and then say, Well if the taxes go up its not our fault. A millage increase would come at a far greater cost for residents, who would have to pay a higher rate at the city, county and public school level, Monti said. to a higher amount than what the sales tax costs, she said. Its crucial that residents under stand the true cost of the penny sales tax if its approved in May, Maloy said. The other side likes to keep saying that its a penny, he said. Its not a penny. SALES TAX | Business rent in peril? C ONTINUED FROM FRONT PAGE THIS WEEK IN WORLD HISTORY MARCH 21, 1963 Alcatraz Prison in San Francisco Bay closes down and transfers its last prisoners. At its peak use in 1950s, The Rock, or Americas Devil Island, housed more than 200 inmates at the maximum-security facility surrounded by frigid water. PHOTO BY TIM FREED THE VOICE The Breakfast Club of Oviedo has built a cult following, but has struggled to keep up with bills from the city. Seminole Voice | March 21, 2014 | Page 5 IN T ERES T S THIS WEEK IN HUMAN HISTORY MARCH 22, 1933 President Franklin D. Roosevelt signs the Beer and Wine Revenue Act. The law levied a federal tax on all alcoholic beverages to raise revenue for the federal government and gave individual states the option to impose further regulations. LOCAL NEWS. BIG IMPACT. DONT LOSE YOUR VOICE! 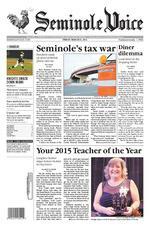 SUBSCRIBE TODAY Visit SeminoleVoice.com/Subscribe or call 407.563.7013 to order today! Get 1 year (52 issues)for only $15. 853 South Orlando Ave.Just south of Fairbanks on Hwy. 17-92 (1 mi. east of I-4, Exit 87)Winter Park, FL 32789 (407) 644-454715,000 sq. ft. featuring 140 dealersOPEN 7 DAYSMonSat 10 Sun 12No Magic Words ... Just good old antiques & vintage!Come see why customers LOVE OUR MALL!Visit us on Facebook. Orange Tree Antiques Mall Orange Tree Antiques Mall SPRING EXTRAVAGANZA SALE MARCH 21-24. been videotaped to demonstrate the Marzano teaching method to new teachers. She is also the founder of the Creative Movements Dance Club at Oviedo. Herself a former danc er, Jarzynka felt it was important to give her students and others with disabilities the opportunity to have a normal high school experience. Bridget Dycus was not only this years Middle School and District Teacher of the Year, she also taught this years Elemen tary School Teacher of the Year when he was in middle school. Her classroom theme is su perheroes, said Shellman, and she lives it, she wont hesitate to help anyone who comes to her. Keith Erickson, himself a product of Seminole County schools, is the Educational Tech nology Facilitator at Layer Ele mentary and this years Elemen tary School Teacher of the Year. There he uses technology to get kids excited about learning, something he may have picked up from Mrs. Dycus computer class back in middle school. Now create video games. They dont know it, but they are picking up a valuable skill while they are having fun, Er ickson said. His fourth-grade classes are using CAD to build roller coast ers and his third-graders are de signing websites. My goal is to relate technol ogy to real life situations and jobs, I want to pass on memo rable experiences that may open inspiring paths for them, Erick son said. For Bridget Dycus, transform ing math from a drudgery many students hate into an exciting prospect is the stuff that keeps her challenged and inspired. You have to make it exciting, you have to make it fun and you have to make it apply to their lives. So for my state-ranked golfer, I make geometry prob lems that have to do with golf ing, for my state-ranked swim mer, we make problems about swimming. I have a budding baker and we always use her rec ipes for ideas for math problems, because math doesnt have to be that dreaded, dry subject that no body loves. Dycus is also an inspiration to her fellow teachers, working with them to share knowledge and support each other. She not only does a great job with her students, but she mentors other teachers and vol unteers to do everything, Shell man said. In Dycus own words, Teach ers are those people who truly cheer for each other, we genu inely enjoy helping each other. For Dycus this is true both at work and at home. Her husband Tim is also a Seminole County educator. He teaches art at Win ter Spring High School. Their twins are eighth graders at Mil lennium Middle School. During her acceptance speech, Dycus recognized her fellow teachers and all the hard work they do. bled to represent the phenom enal educators in this county, she said. I know the talent and expertise and the dedication, because I experienced it as a stu dent in [Seminole County] class rooms. I have had the pleasure of teaching the grandchildren of some of the teachers who taught me. My greatest inspiration though comes from my children, I just aspire to be the teacher that they deserve. TEACHERS | Two of three finalists for the 2015 Teacher of the Year came from Oviedo and Winter Springs C ONTINUED FROM FRONT PAGE PHOTO BY ALLISON OLCSVAY THE VOICE Seminole County Schools Teacher of the Year Bridget Dycus, right of center, poses with School Board ofcials after winning March 13. Page 6 | March 21 2014 | Seminole Voice AT HLE T I C S THIS WEEK IN SPORTS HISTORY MARCH 20, 1897 FORECLOSURE DEFENSELAW OFFICE OF TIMOTHY A. MORANCertified Florida Specific Foreclosure Prevention CounselorTel: 407-366-TLAW (8529)www.tmoranlaw.net tim@tmoranlaw.net Fax: 407-366-8528 1750 W. Broadway St., Ste. 118 Oviedo, FL 32765Initial Consultation FREE! 2013 Voted Best Law Firm in Oviedo The Knights baseball team made a big impression against the No. 25 Miami Hurricanes Tuesday, dominating them in a 9-2 blowout win. Tanner Olsons eight innings on the mound and only two runs allowed kept the Knights ahead the entire game as they piled on the runs. Derrick Salberg and Sam Tolleson each had three hits and an RBI in the game, which lifted the Knights spirits after a loss on Sunday to Central Con necticut. The Knights had already turned a weekend of bizarre twists into two wins when they stepped into the 10th inning of game three against Central Con necticut (2-2) and everything fell apart. The 5-4 extra innings loss in losses in one. The Knights (9-12) lost a lead that they had held for all but half an inning for the entire game when they gave up two runs in the ninth on a oneout, two-RBI single that would change the course of the game in an instant. Two 10th-inning pass the Knights were sunk. Sam Tolleson gave the Knights most of their offensive with two RBI in the game on a double and a solo shot. The Knights would use six pitchers in the game, with Zach Rodgers giving up just two runs on 5 and 1/3 innings pitched while striking out three. Tyler Martin would draw the short straw in the game, giving up the loss and retiring none in his 10th inning relief appearance. With a lot more baseball sea son left to go the Knights start up American Athletic Confer ence play March 21 with a threegame series against Cincinnati (7-11), which is nearly the con ference basement dweller. The Knights will be looking to shore up their AAC credibil ity after a disastrous season for UCFs basketball teams, both of which had lopsided losing games at 4 p.m. on March 22 and 1 p.m. on March 23. Rollins baseball Three games into Sunshine State Conference play, the Tars have three conference losses. The Tars dropped all three to Tampa at home by 9-0, 6-3, and 12-8 margins. letto, batting deep in the order, cranked out three hits in four at bats and scored two runs to try to boost the Tars to victory Sun day, but a wild 12-run effort by Tampa (23-1, 6-0), which took the lead on a four-run eighth in ning, decided it. With the losses, the Tars (1211, 0-6) sank to the bottom of the SSC standings, below win less Saint Leo. They head to St. Petersburg to face Eckerd (14-6, 4-2) this weekend, then take off to Miami Shores for a threegame series against Barry (178, 1-5) on March 28-29, but will return home for a game against Saint Leo (14-8, 0-3) at 6 p.m. April 2. ARCHIVE PHOTO BY SARAH WILSON THE VOICE The Knights bats stayed hot, but not enough to keep up with Central Connecticut in an extra innings loss that stopped a sweep. Knights dominate No. 25 Miami ISAAC BABCOCK The Voice K4 12th grade Oviedo Campus 407-971-2221.MA.e Master's Academy, a community Christian school, admits students of any race, color and national ethnic origin. Thank you for voting TMA Best Private School! ARCHIVE PHOTO BY ISAAC BABCOCK THE VOICE The Knights strong pitching kept them ahead of No. 25 Miami in an upset win. Seminole Voice | March 21, 2014 | Page 7 HEAL T HY LIVING In spite of our sun-splashed Central Florida days, many among us face some pretty dark days. Some of our Central Flor ida friends, family, and neighbors are dealing with terminal ill ness, facing the possibil ity of the end of their days. Death is more unavoidable than taxes, but how would you prepare for it? Everyone wants to be comfort able. Most of us want to be in con trol. And the vast majority of us or hospitals. Theres no place like home, said Dorothy as she clicked her magic shoes together. Everyone has a different perspective on treat tors are trained to treat, as pointed out by physician author Atul Gawa Each person may have his or her own sense of how far down the treatment road he or she may want to go. Hospice is an option for main taining the highest quality of life possible and preparing for the end of life. More than 44 percent of peo ple who died in the United States in 2011 were under the care of a hos pice program at the time of their death, according to the National Hospice and Palliative Care Orga nization. Who is hospice for? When the diagnosis is for limited survival, hospice is an option. Patients facing a condition with limited survival can be taken in if they have been six months to live, although timeTwenty years ago, most hospice patients had cancer, but now endstage heart, lung, kidney and liver diseases are common reasons for hospice. A common myth is that hos pice is only for the very last days of life. Hospice can provide sup portive services for many months and help the patient and family prepare for lifes biggest transition. A multi-disciplinary hospice team, including a nurse, physician, social worker, clergy, and home health aide keep the patient as comfortable as possible. This diverse caregiving team can help control symptoms and pain, guide and support fam ily members providing care, and address issues important to the pa tient and family. Hospice can also give quick-response care when pain ity of hospice patients stay in their own home for most of their care, although facilities are also available when intensive care is needed. Some patients and families see choosing hospice as giving up. Others see it as regaining control staying in the comfort of home as long as possible. Patients have the option of leaving hospice services at any time. Some opt out of hospice if symptoms improve or they de cide to pursue treatment. One study found hospice patients lived an average of one month longer than similar people who did not opt for hospice. This may be because the hospice patients symptoms were managed, they did not undergo risky last hope treatments, and they did not experience iatrogenic (caused by medical care) complica tions. Are all hospice services the same? No, and no two patients are the same. Central Florida has sev eral hospice services, caring for pa tients in different counties through out the area. Just like every school and every restaurant is different, each hospice has a different feel. hospices. We have hospices go ing through transitions along with more stable organizations. If you are considering hospice, you can have several hospices visit you as you decide if it is an option for you to explore your options early rather than waiting for a crisis. A discus sion with hospice is not a commit ment; it can provide information and options to consider for some tough questions. Get more information at hos picefoundation.org Hospice and how we care for our nal days Dr. Nancy Rudner Lugo Health Action I just read that the new ABC drama Resurrection led the pack in terms of viewership for Sun day night TV on March 9. The prem ise of the show is that someone who has died miracu lously returns from the dead in order to help people work through unresolved issues and grief. that the viewing public is still enam ored with people returning from the dead even though we live in a post-Chris tian society, with the entertainment indus try leading the way in skepticism about Christianity. While we can wander away from Christ, we cant wander away from there life after death? The Old Testament book of Ecclesiastes beautiful for its own time. He has planted eternity in the human heart, but even so, people cannot see the whole scope of Gods work from beginning to end Ecclesiastes Nearly every culture that has ever exist ed has embraced some version of an after life. Even our hyper-materialistic 20th Cen in which people came back from the dead, sometimes as zombies, sometimes as rein carnations. Even when we deny an afterlife it seems we cant stop thinking about it. Its in the human heart. The Ecclesiastes passage reminds us that human knowledge, at least in the realm of eternity, is limited. When we dont know, the urges of the human heart will cause us to use our imaginations to dream about what we hope for and desire, or even fear. And so, we will continue to fantasize about what might be or could be. And the enter tainment industry will continue to feed our curiosity. About a month from now we will be celebrating Easter, when Jesus conquered the grave. Throughout history millions of Christians have not just placed their hopes of his version of eternity, they have bet their lives on it. They have understood that because of Jesus death and resurrection, those who believe in Him can experience a resurrection where there will be no more I have seen the power of this understand ing played out in funeral homes around the world. Like everyone, Christians grieve the loss of loved ones. But behind their tears is a conviction that God himself will one day wipe away those tears. Its a story worth a second look because in the end, eternity is not what we make of it, but what God has made of it. Just sayin. Resurrection and our life-after-death obsession Jim Govatos Reality Lines OF CENTRAL FLORIDA CELEBRATING OVER 25 YEARS SERVING YOUR COMMUNITYBernard S. Zeffren, MD Eugene F. Schwartz, MD Winnie Whidden, MSN, ARNP-CVoted Best Doctors of Central FL, Orlando Magazine for 7 consecutive yearsDiplomates American Board of Allergy and Immunology Evening Hours Available793 Douglas Ave. Altamonte Springs, FL 32714407-862-5824 2 locations in Seminole County7560 Ste. 2064 407-366-7387www.orlandoallergy.com For Tickets Call 321.268.1125 Or Visit www.TitusvillePlayhouse.com Presented through special arrangement with Samuel French, Inc Written By: Alan Bailey & Ronnie Claire Edwards Four garden-club ladies meet a young girl who has come to their little Texas town to marry an infantryman before he ships o for World War II. The women impulsively decide to throw the girl an elaborate wedding, and their lives and friendships are thrown into turmoil as they race to accomplish the nuptials in one frenzied afternoon. Seminole Voice | March 21, 2014 | Page 9 Luau is set in the lush landscaping Universal Studios. The adventur ous evening features tropical cuisine, cocktails, live entertainment, crab races, and a silent and live auction. The event raises funds for Team Florida as they journey to compete in the 2014 USA Special Olympics. Celebrate the transformative power of the Special Olympics on March 22 and say aloha! to Team Florida. Visit March 23 Frank Lloyd Wrights architecture in Florida Kenneth Treister, co-author of Taj Mahal, will discuss his new book and his connection to Frank Lloyd Wright at Lakelands Florida Southern College on March 23 at 10 a.m. Following the presentation is a book signing and optional tour of the worlds largest collection of Wright architecture, including a visit to Usonian House, the only Wright house built since the late 1960s for its original client on its original site. The brunch is $10 and the tour is $20. RSVP to Bobby Baum at 863-686-8820 or rbaum@gte.net CULTURE | Tour the worlds largest collection of Frank Lloyd Wright architecture at this unique event C ONTINUED FROM PREVIOUS PAGE Please see CULTURE on page 10 Thursday, April 10th from 5pm 7pm Thursday, April 10th 5pm to 7pm Thursday, April 10th 5pm to 7pm Thursday, April 10th 5pm to 7pm Revolutionizing the way America shops for elder care and services. Loud & Clear and FREE Florida residents with a hearing loss are eligible to receive a free amplied phone from the non-prot Florida Telecommunications Relay, Inc. Cordless and corded phones for persons with mild to severe hearing loss are available at 23 distribution centers statewide. Limit one per customer.CONTA C T YOUR AREA C ENTER FOR DETAILS Center for I ndependen t Living in Central F lorida 720 Nor th Denning Drive Winter Park, FL 32789 407-623-1070 (v) 407-623-1185 (tty)Current FTRI clients: If your phone isnt working properly or your hearing has changed, or should you no longer need your phone or are moving out of Florida, call FTRI at 888-554-1151 for assistance. 2069 Aloma Ave. Winter Park, FL 32792 762 E. Altamonte Drive Altamonte Springs, FL 32701(407) 691-3009 (407) 679-2135 Visit us on the web @ www.binsons.com r fntbt f rtt ftbt bt bnr nr rt b bb f b tb off trtnCoupon redeemable for cash, check or credit card purchases only. Not redeemable for insurance transactions. Excludes custom/special orders & nutritional supplements. May not be combined with any other dis counts. Coupon has no cash value.